Best Dressed Christmas Windows in Strabane | SCENE! 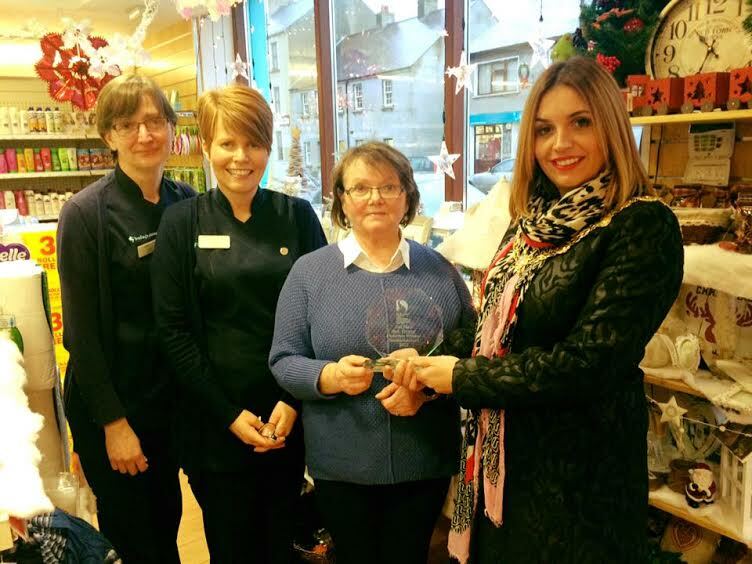 Mayor of Derry and Strabane District Council, Cllr Elisha McCallion was in rural towns and villages in the Strabane area this week to present prizes to local shops and businesses who participated in the Best Dressed Christmas Window competition, organised by the Council through the MourneDerg and Glenelly Action Plan. The idea behind the scheme was to encourage local businesses in the towns and villages to do what they can to dress and promote their business and help develop local community spirit and pride as well as helping to improve the image of the local area in the run up to Christmas. The competition was organised as part of the Rural Towns Switch On and late night opening events that took place in Castlederg and Newtownstewart in an effort to encourage engagement with local businesses and to encourage people to shop local. Mayor Cllr Elisha McCallion visited the winners of the competition in Newtownstewart and Castlederg today where she presented them with plaques in recognition of their efforts. The competition winners are: – 1st Place McLaughlin Decor – Corlin and 2nd Debra’s Hair Salon (Castlederg) and 1st Hood & Co Store and 2nd Place Bradley’s Pharmacy ( Newtownstewart). ‘This was a fantastic way of engaging with local businesses and encouraging them to take an active role in promoting the local offering, improving the shopping experience and encouraging local pride and community spirit. A lot of hard work and effort has gone into dressing shop windows across the towns and villages in the Strabane area and I am delighted to be here to present the winners with their awards. In addition to congratulating the winners I would like to extend my thanks to everyone who participating and of course thank the wider local community for their continued support of local businesses,’ she said. Susan Doherty, Economic Development Manager with Derry City and Strabane District Council said the competition was an important way of the Council helping local businesses to maximize marketing and promotional opportunities. She explained that the Mournederg and Glenelly Action Plan Committees meet on bi-monthly basis to deliver a key priorities including improving the internal and external image of the areas, supporting community and developing community pride via promotional events.